I’m amazed with the detail you manage to squeeze into such a tiny space! Those little sentiments are so stinkin’ cute!! I’m just going to have to downsize my thinking for a while and try using these inchies after seeing what can be done with them! TFS your fabulous ideas!! Oh my my my! these are so fun to look at! Such tiny details! 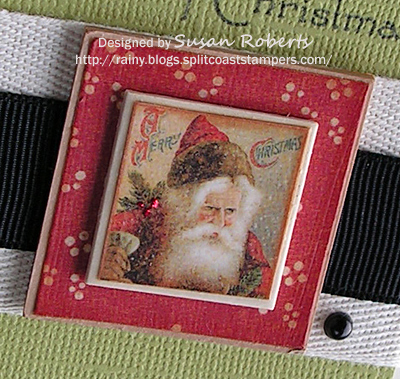 Wonderful use of vintage designs. Shows off the intricacy of the design with just the right amount of embellishment. Lovely. These are so pretty Susan. I love seeing the texture on each card too. You can totally tell you enjoy playing with them! Wowza….all I can say is wowza! These are fabulous, Susan! 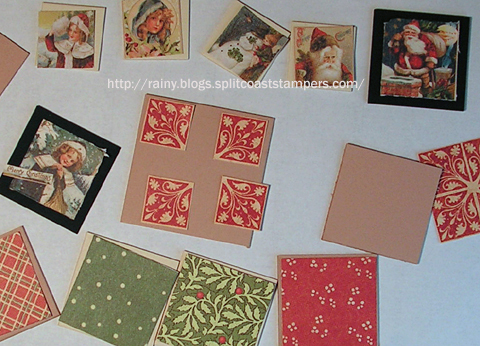 I need to make a set of 4 cards as a Christmas gift and I may very well steal your idea for that second set. Great job! Wow! 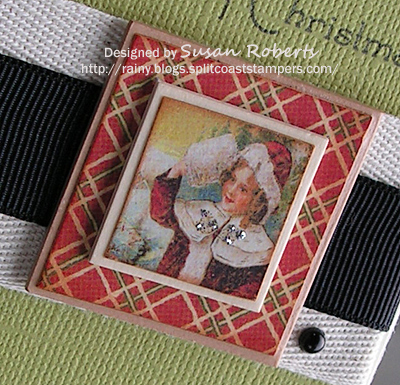 I am a big inchie fan and I ADORE the graphic 45 images. What a fabulous collections of cards. Love the all!! Holy cow Susan!! These are all STUNNING!! I adore vintage, and your cards are each unique and beautiful!! WOW! Simply amazing! What you can do with 1 square inch of paper is incredible. Love all your designs and ideas! 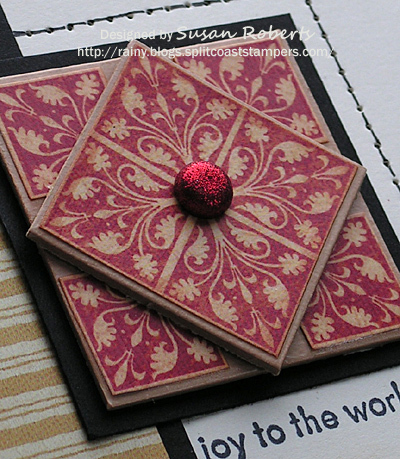 I just have to get past the idea that I “must” stamp to call it a card! Your Graphic’s 45 images are so beautifully done! Gorgeous cards! Those little images make a big impact! These are gorgeous, Susan. So clever and so pretty! I love them all, but Joy to the World with the “red” is my favorite. They’re beautiful. how extremely pretty!!! I LOVE these vintage images! And I love how you made such a tiny image the whole focal point! 🙂 Love your Christmas cards!!! 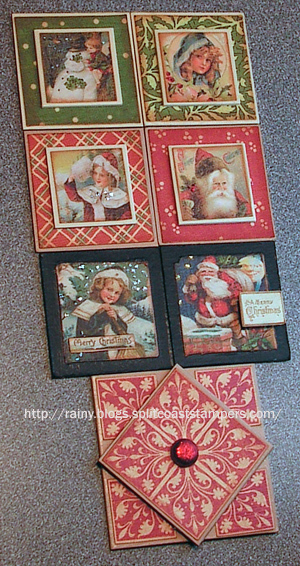 Terrific cards, love your piercing on the santa card and the embossing and layout of the girl card, great framing in the second set! Oh wow!! Susan, these are fabulous! 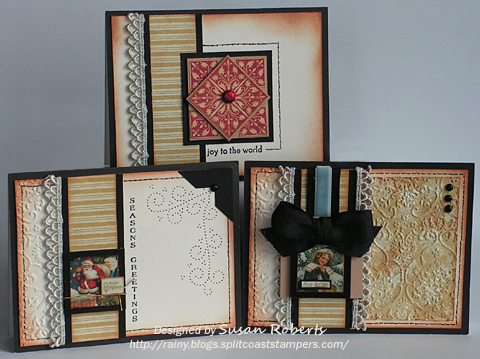 OMG, Susan…what fabulous cards!!!! 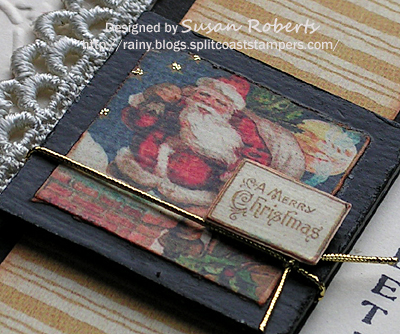 Who knew that inchies could look sooo good….I’ll have to make some of these, for sure!!!! These are so pretty, Susan! The two sets are very different, but each so special and finely crafted. It looks like you had a lot of fun putting them together! Two words Susan – OH WOW!!! Absolutely gorgeous my friend – You are such an inspiration! Thank you for all you do!!! 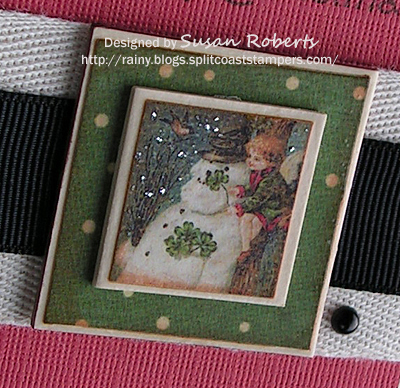 And I love inchies too because you create so many beautiful cards with them! Love all the texture and paper piercing on the first set! And what a great idea with the riibons on the secon set! Wow, Susan! These are absolutely beautiful. 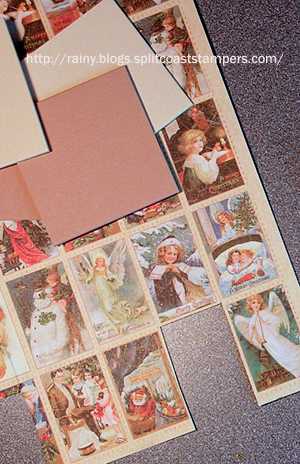 I have these vintage images and some inchies so thanks for the inspiration to put them to use. 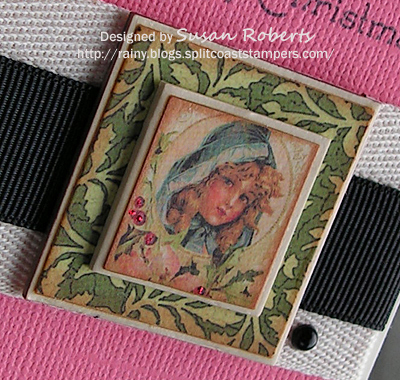 Love the decoupage idea. 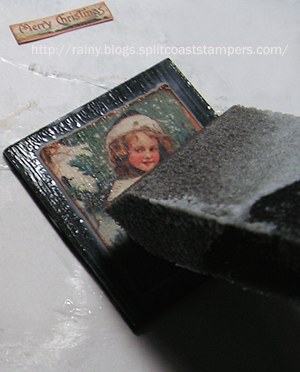 Adds to the finished antique look of your creations. Beautiful and elegant!!!! 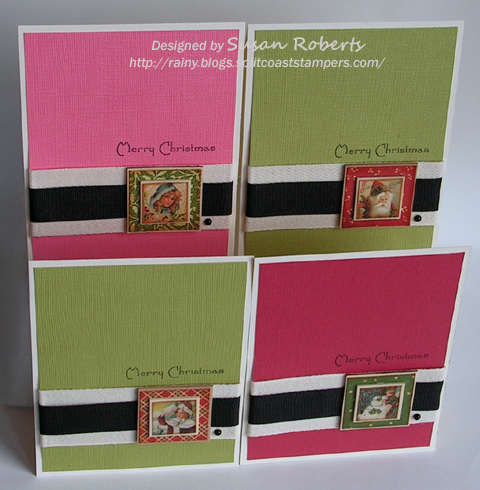 Such wonderful, beautiful cards – no wonder you are having so much fun with these inchies – your work is incredible!! Love these cards. They are so elegant. Can see why you love the inchies…you use them so well! 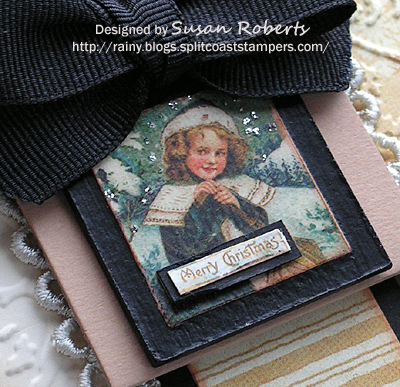 They’re so beautiful and elegant, Susan…and I love the vintage images!! Incredible work, as always!! In preparing to leave a comment, it seemed that every fabulous adjective to describe your creative use for these “inchies” had been “taken” by others — some of the things I wanted to say were “incredible” – “Woza” — “beautiful” “adorable” — well they are truly all of these things! I can see why you are “hooked” — I want to be too! Love the vintage look! They are fabulous! WOW! I love these cards!! They are all so beautiful!